Roger has been sketching and painting for fifteen years. He was accepted as a full member of the Leicester Sketch Club in 2002 becoming President in 2006 and 2010. His style was influenced firstly by the boldness of the Scottish Colourists then by the designers of the silk screen railway posters who made such a strong impression with flat planes of few colours – a method used to great effect by the late Hugh Collinson, who advised him to concentrate on acrylic as his medium. 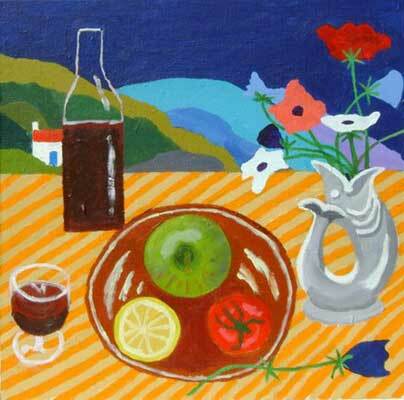 Later the beautiful still life paintings of Reg Cartwright against outdoor backgrounds inspired him as did those of Mary Fedden with her original choice and placement of objects. He visits as many exhibitions as he can to learn and appraise. Roger has shown his paintings in many local venues including Northampton Open Studios, Kibworth Art Lovers’s exhibition and several appearances in the City Gallery Open. One of his pictures was selected for Patchings and twice Leslie Goodwin has chosen to illustrate his work in the review of the Leicester Sketch Club’s annual exhibition in the Leicester Mercury.